The “big bang” … set matter whirling in a maelstrom of activity that would never cease. The forces of order sought to bring this process under control, to tame chance. The result was not the rigid order of a crystal but the order of life. 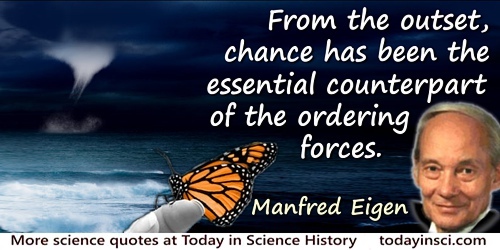 From the outset, chance has been the essential counterpart of the ordering forces. As co-author with Ruthild Winkler, trans by Robert and Rita Kimber, in The Laws of the Game: How the Principles of Nature Govern Chance (1981, 1993), 3.